While I don’t intent this blogzine to appeal only to Americans, some things have happened here this month that deserve a little comment. January ’09 was quite a mix of “heroes” and “villains” (I use quotes because, as you know, things are rarely completely black and white). The Obama’s became heroes to many as they became First Family, their arrival to the White House celebrated in an extravagant event witnessed by a very large, often very emotional and very diverse crowd (I am tempted to think of this as a good metaphor for America in general). There are plenty of villains to temper the presence of our heroes, however. Chesley Sullenburger III and his flight crew did their jobs perfectly under extraordinary circumstances and became heroes for it, while the governor of Illinois got ousted for his less-than-perfect performance and what Newsweek called “Rod Blagojevich’s ‘[expletive] them’ politics.” People like Bernie Madoff are still floating around; tax-payers balk at what looks to them like misappropriation of funds with industry bailouts; in my home state of New York the Seneca Nation is still fighting treaty battles. There are “good guys” and “bad guys” in every country, and which there seem to be more of changes pretty often. But let’s be honest — either we seem to mind the “bad guys” less when we’re generally prosperous, or poor economic times just throw a spotlight on our villains (and this goes for the world, not just the U.S.A.). Bernard Madoff, for example, started his Ponzi scheme a while back, and industries have been giving bloated salaries to their CEOs for ages. The difference is that now we are hearing more about them, and now it really seems to matter. Whoever said “we read to know we’re not alone” was very wise. 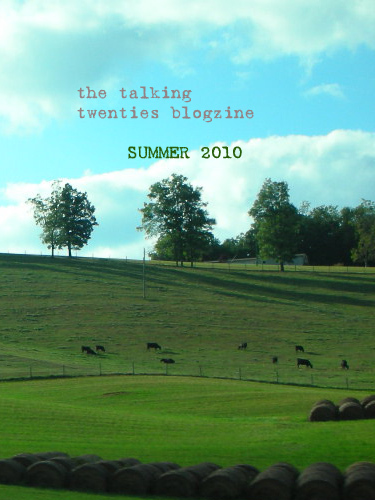 I can’t fix your problems with The Talking Twenties, and neither can the other writers, but I hope that we are helping to give those problems some perspective and offer a little solidarity for those of you experiencing difficult times. I still stand by my statement in my first editorial that this is “our time.” What we choose to make of it and of ourselves, whether we get remembered as “the good guys” or “the bad guys,” is up to us, and a lot of it will be determined by the choices we make now, in this developmental time in our lives, both despite and because of what we are experiencing. If nothing else, I get the feeling that what we are going through as a global economy now is going to create a generation of better informed, more involved citizens. Because, after all, if our parents’ generation had cared more, protested more and been more proactive after the 60s, we might not be here in the first place.